Coronado National Forest is a noncontiguous national forest in southeastern Arizona. 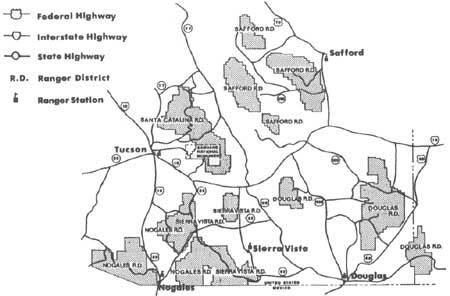 Its five districts are Sierra Vista, Nogales, Safford, Santa Catalina, and Douglas. These districts occupy nearly 2 million acres and encompass numerous mountain ranges (fig. 109). The Region is largely desert, interspersed with isolated, rugged mountains and steep canyon country. Climate and forest resources vary greatly according to elevation. Figure 109Coronado National Forest, AZ and NM. Originally nicknamed "Islands of the Desert," the Coronado National Forest was officially established in 1908 when three forest reserves, the Santa Rita, Santa Catalina, and Dragoon, were consolidated (fig. 110). Civilian Conservation Corps projects on the Coronado focused primarily on water-related activities, such as stream development, erosion control, development of watering areas for stock, and well digging. Because there was less forested acreage, timber management and forest revegetation projects were not as time-consuming as elsewhere. Additional CCC work revolved around livestock and grazing interests, historically significant in the area. Relations between foresters and ranchers were precarious for years. With the onset of the 1930's and the CCC, the Forest Service found ways to enforce grazing restrictions largely through the establishment and fencing of grazing allotments. Ranchers were eventually persuaded that regulating grazing, improved overgrazed areas and, ultimately, the quality of livestock. Civilian Conservation Corps crews were used to build fences, cattle guards, stock tanks, and corrals, and to revegetate grassland areas. 1. First were those occurring in the high mountainous areas of the Santa Catalinas and Chiricahuas. Areas in this zone were planned for persons wishing for the maximum change in climatic conditions. Summer homes, organized camps, and camping, picnicking, and winter sports facilities are found here. In general, CCC building projects were adapted to the natural landscape by using materials from the local environment and traditional designs. Use of adobe was one important method. Adobe brick was traditionally molded from sand and clay mixed with water. Straw and grass were included in the mixture as binders. Prepared mud was placed in wooden forms, tamped, and leveled by hand. The bricks were then turned out of the mold to dry on a level surface covered with straw or grass so the bricks would not stick. After several days of drying, the adobe bricks were stood on end and air-dried for a 4-week period. The CCC followed this traditional method. By May 1940, Company 2870 at F-10-A was under the command of First Lieutenant Gordon C. Murray. Camp superintendent was William H. Hughes. 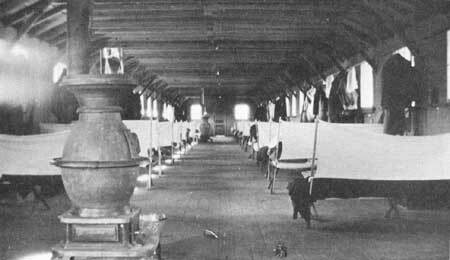 Of the 188-man company, 116 were recent replacements at the camp. There were problems with morale and desertions. A major concern was the condition of the camp buildings. After 6 years of continual use, they were in need of major rehabilitation. F-10 closed at the end of the CCC in 1942. The camp's major work achievements included the Portal Ranger Station office, dwellings, barns, and corrals, South Fork Campground, and Rustler Park Fire Guard Building and latrines. The office at the Portal Ranger Station is located in a wooded area and is atypical. It is approximately 34 feet wide and 15 feet long (fig. 111). The building is made of wood with riverbed rock veneer laid in mortar. The gabled section of the roof line is covered with decorative half-timbers. Porch posts are half wood and half riverbed rock. Figure 111Portal Ranger Station, Coronado National Forest, AZ. The office interior is divided into two living rooms and one bathroom. A closet is located in each room. There are two front doors. The windows are six-over-one, double-hung sash type. The Patagonia and Canelo Ranger Stations show vividly how uniformity of structure design can, with slight modification, result in a distinctively different appearance from one site to another. The two stations, especially the residences, reveal how standard plans were varied to create distinctive sites despite the basic structural similarities of the buildings themselves. 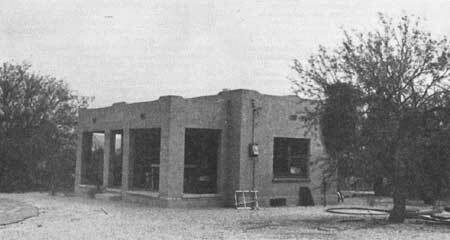 Constructed in 1934, the Patagonia Ranger Station is located just northeast of Patagonia, AZ. The buildings at this station consisted of an office (now a residence), a residence, a garage, a barn, and a storage room or dynamite shed. All buildings are identical in plan to the Lowell Ranger Station except for the barn and garage. The layout, however, is somewhat different in order to fit the surroundings. All of these buildings, except the garage, have been modified. The residence faces east and is approximately 35 feet wide (fig. 112). It is 50 feet long, rectangular in shape, and includes front and back porches. The residence is identical to the Lowell residence except that it does not have a side porch. The residence interior contains two bedrooms, a bath, living room, dining room, and kitchen. The front porch has been enclosed and used as a room. The building is made of adobe, has a flat roof with drains, and six-over-one, double-hung sash windows. The Patagonia office faces east, in line with the residence. It is 30 feet wide and 35 feet long. Its front porch is now enclosed. There are two front doors, two rooms, and a bath projecting from the back of the building. The ranger station garage is 35 feet wide and faces east, in line with the other buildings (fig. 113). There is a single-entry front entrance and two garage doors about 18 feet long. The interior is separated into three rooms. The barn faces south and is located on a slight rise. It has a front door and small side window. The interior has a concrete floor and hay window. Attached to the rear is an enclosed lean-to that originally was open. The barn is now used for storage. The storage room is located on a rise behind the garage. The concrete walls are very thick and slope inward. The building was possibly used to store dynamite. The Nogales Ranger Station was built by the Box Canyon Camp in 1934-35. The station includes a residence, office, storage building, garage, workshop, and barn. The barn and garage are identical in design to the Patagonia buildings. The Nogales ranger's residence faces east. It follows the same plan as Lowell Ranger Station except for a front porch extending across the entire width of the building. The building is 30 feet wide and 56 feet long. Clay tile detailing on the roof was added for decoration and possibly to aid water runoff. This detail appears on all of the Nogales buildings and is unique to this complex. The office also faces east and stands in line with the residence. It is 30 feet wide and 17 feet long. 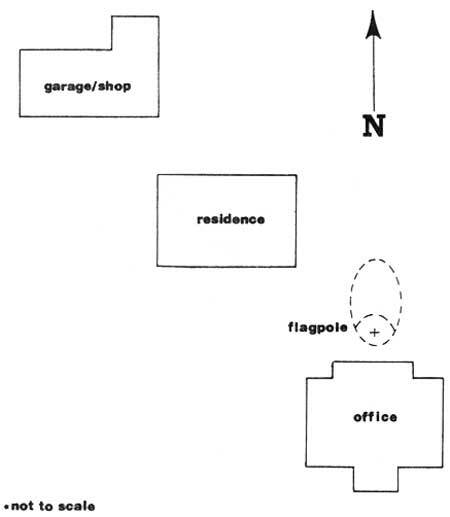 The building plan is identical to the Lowell Ranger Station office. The front porch has been enclosed to provide an extra room. The original camp consisted of tents and was occupied by a veterans company. Frame structures were completed in December 1933. 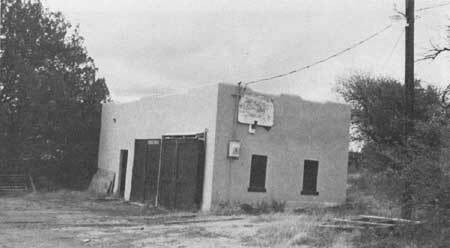 The veterans company was responsible for building an adobe clubroom containing a canteen. The mess hall was an extension of that building and was made of adobe. The company occupied the Rucker Canyon site until May 1934 at which time the company was transferred to the Tusayan National Forest. The Rucker Canyon campsite was reoccupied in October 1934. 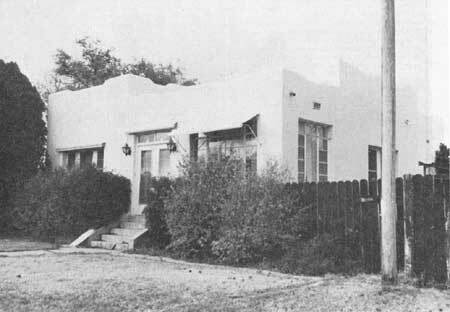 In February 1935, F-12 was occupied by Company 830, a company of junior white enrollees from Arizona and Texas. Company commander was R.H. Fullenwider, and project supervisor was C.L. White. Company strength was 204 men, 65 of whom were locally enrolled. By October 1937, the Rucker Canyon Camp was occupied by Company 2870, another junior company with enrollees recruited from Arizona, Oklahoma, and Texas. Company strength was 168 men with no LEM's. The company commander was First Lieutenant Alva E. Lindsay; project supervisor was W.H. Hughes. Among Sunnyside's work projects were construction of the Lyle-Parker Road and improvement of the side County Road as far as the Santa Cruz County line. A side camp was operated in the winter of 1934 at Sand's Ranch. Camp F-13-A closed permanently on October 21, 1935. Alex Gonzales was an LEM for the Sunnyside Camp, F-13-A, from October 1933 until April 1934. He was 19 years old when he joined and had been working in the local area as a rancher and farmer. Gonzales recalls that when the CCC started all the Coronado land was open range. Cattle from different herds ran together, and each rancher would pick his cattle by brand. 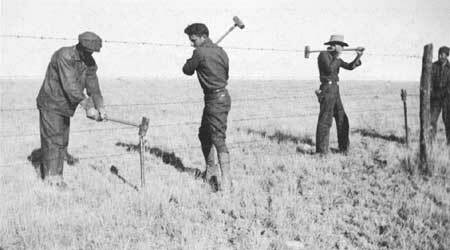 The CCC began dividing the range into allotments by building roads and fences. Gonzales' main job was on a roadbuilding crew. He was designated cattle guard inspector. The guards were made of railroad rails and welded in camp. He says that the ones he built that year have now been replaced by larger ones. The name "Sunnyside" was given to the area by a religious group who settled there in the late 1800's. The camp itself was actually in Parker Canyon. After some 45 days in tents the men moved into new barracks. The frame buildings housed 50 men each. Camp water had to be pumped 1-1/2 miles from the Collins Spring. Gonzales remembers the following buildings at the Sunnyside Camp: four barracks, each with bath facilities (fig. 114), a blacksmith shop, an auto repair shop, a clinic, a PX or commissary, a recreation hall, dining hall, kitchen, and several storage buildings. Ice was brought in every 4 days. Perishables were kept in ground dugouts and covered by roofs of canvas and tin. Alex recalls that the food was good, but there was some waste. A disposal pit was dug daily to dispose of garbage. Cookstoves were fired by coal hauled in probably from Tucson. The recreation room was equipped with a radio and decks of cards. The men also played ball games and horseshoes. Because of its isolation, Sunnyside did not play against other camps. Gonzales thinks there were about 200 men at Sunnyside. About one-fourth were enlisted from the local county, and the rest came from New Mexico, Texas, Nevada, Oregon, and Colorado. Every Friday after work four trucks left camp for Tucson, Nogales, and Douglas. The men would stay away for the weekend and make their own arrangements for returning to camp. Don Willis was enrolled in the CCC for two years from 1933 to 1935. He was only 16 when he joined and lied about his age in order to get in. He was first an enrollee at Sunnyside. Later he moved to Flux Canyon, spending summers at Mesa Verde National Park. Don Willis worked on a cattle fence line that he refers to as "an assembly line operation." First, a surveyor laid down the fence line. Then two men used sledgehammers to pound a bar into the ground every 2l feet to indicate postholes (fig. 115). Next, men with dynamite blasted the holes, which were then cleared out by the next crew of men with bars and shovels. LEM's cut juniper posts and hauled them to the fence line with burros. Another crew set the posts. Juniper was used because it does not rot and lasts for an average of 60 years. Finally, wire stringers put up wires between posts; bales of wire were hauled by hand or burros. Strong evidence points to the use of CCC labor in improving the grounds around Canelo Ranger Station. The close proximity of the Sunnyside Camp in the summer of 1933 is one indicator. At least one enrollee remembers working at the station. Among the observable improvements are road work, stone walls, landscaping, and corrals. A small helicopter landing pad is located just above the ranger station, but it is not known when this was constructed. 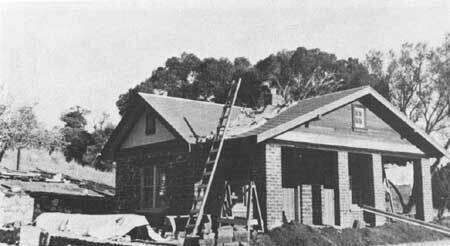 The basic building plans for the Canelo Ranger Station are the same as found at the other ranger stations on the Coronado National Forest; however, by altering the roofline and using a different combination of building materials the entire appearance of the buildings was changed. This complex presently consists of a residence, office, garage, and barn. The residence plan is similar in style to other ranger station residences on the forest. The front porch extends across half of the front. The house faces south. The building measures 35 feet wide and 45 feet long. Both front and back porches are screened in. The walls are adobe, and the wooden roof is gabled with brackets. Inside the residence are two bedrooms, a bath, dining room, living room, and kitchen. The basement has an outside entrance with an added shelter over it. Windows are deeply set six-over-one, double-hung sash type. Rough-cut rock retaining walls surround the house. The Canelo office sits high off an unpaved road and looks east toward Turkey Creek (fig. 116). Identical in plan to the Patagonia and Lowell ranger station offices, this office also has two entrances, two interior rooms, and a projecting bath. An addition has been made to the rear, or north, side. The office is constructed of adobe, but instead of a flat roof, the roof is gabled with wooden shiplap and brackets. This change in roof line completely alters the building's appearance. Instead of a desert adobe building, it is a gabled building, designed appropriately for its wooded setting. Cypress trees in front of the office have grown so large they hide the building. Figure 116Office, Canelo Ranger Station, under construction in 1933, Coronado National Forest, AZ. The Canelo garage also has a gable roof, but no brackets. It is located behind the residence and faces east (fig. 117). It has three garage doors, two the same style and one different. It has a single entrance doorway. There are three windows on the west side and two on the south. Figure 117Garage, Canelo Ranger Station, Coronado National Forest, AZ. The barn is an adobe structure that has a gable roof with no brackets. There is an open lean-to at the rear, a front door, one south window, a concrete floor, and a hay window. The barn is located behind the garage on a slight rise (fig. 118). Figure 118Barn, Canelo Ranger Station, Coronado National Forest, AZ. In addition to a variety of other projects, the Madera Canyon Camp was responsible for major recreational developments in both the Santa Rita and Santa Catalina areas, including the Madera Canyon Upper and Lower Campgrounds. On the Santa Rita Experimental Range Reserve, the Madera Canyon Camp worked extensively at the Florida Station. Projects included boundary fencing, grounds maintenance, and stream control dams (fig. 119). Camp F-30 was the primary CCC camp assigned to work at Sabino. During the fourth enrollment period of November 1934 to March 1935, the camp rebuilt 14 fireplaces and constructed 1 table, 2 flush toilets, sixty 18-inch culverts, 3 septic tanks, 1 garbage pit, a rubble masonry bridge of 60 feet by 5 feet, 2 rubble masonry registry booths, one 33-foot rock settee, and a well. A 1,650-foot-long rock wall was also rebuilt. Prior to 1934, the Tanque Verde (F-42) camp did maintenance work at the Sabino Canyon Recreation Area. 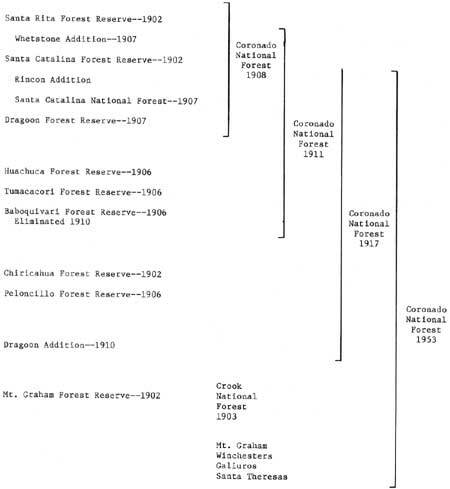 Coronado's "Forest Recreation Plan" states that "since 1933, the emergency period, the Forest Service, in cooperation with various other government agencies, has done a substantial amount of recreational improvement work in the lower portions of Sabino Canyon. The entire development was designed for public use." 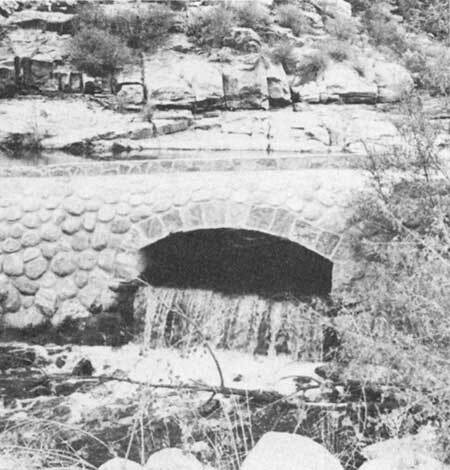 Much of the CCC's work in the Sabino Canyon Recreation Area still remains, including part of a dam made of smooth riverbed rock. Drinking fountains made of smooth riverbed stone also remain (fig. 120). 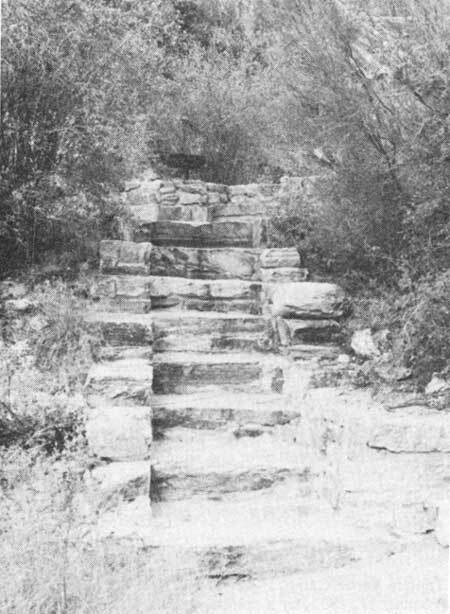 Rock steps, built of rough-cut stone taken from nearby hillsides, lead up to picnic areas and down to the river (fig. 121). 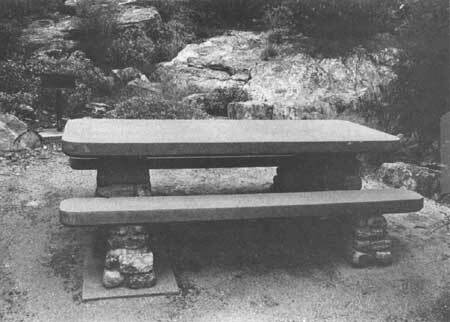 Picnic tables have legs made of rough-cut stone; table tops and seats are made of concrete slabs (fig. 122). About 10 CCC-built bridges are found in the canyon; no two exactly alike. Some are constructed completely of rounded riverbed rock, some are rough-cut stone, and some are a mixture of both. It should be noted that the WPA helped build these bridges, as is evident by the metal marker placed on a few of the bridge posts (fig. 123). The caretaker's residence and garage were constructed of rough-cut stone rubble gathered from the area. Framing was most likely wood with a stone veneer. 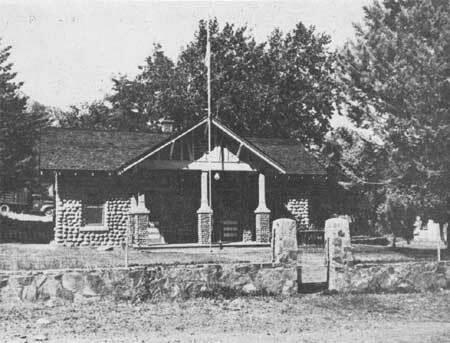 Shape and style were similar to the Lowell Ranger Station buildings, the residence being most like the ranger station office. Both buildings have been demolished. The residence had two entrances and two rooms, plus a bath and a kitchen. There were an open front porch and a flat roof with castellated or parapet type projections. An addition was made to the back of the building at a later date. Many of the CCC-constructed firepits at Sabino still remain. As simple as they look, pages were devoted to their design in the Forest Service Recreation Handbook and Acceptable Building Plans. Located on top of Mount Lemon, this lookout was constructed of wood (fig. 124). It is a square building with windows on all four sides. Wooden flaps were made to be raised or lowered over the windows. Steel cords helped to stabilize the lookout. This tower was probably built by the Madera Canyon Camp or one of its side camps. Available data are inconclusive. Figure 124Lemon Rock Lookout, Coronado National Forest, AZ, August 1941. Tanque Verde Camp, F-42-A, was first occupied on November 17, 1933, by a company from Wyoming's Medicine Bow National Forest. 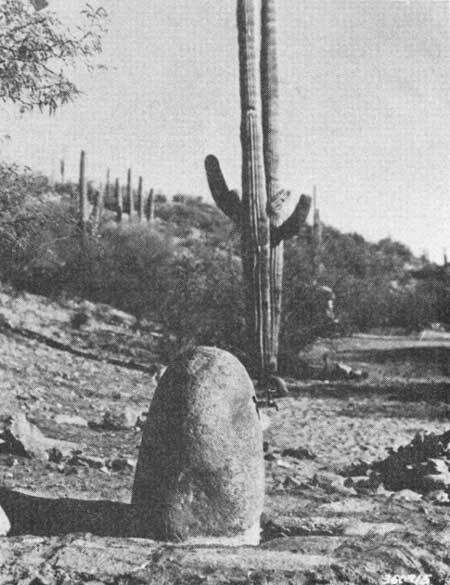 Tanque Verde Camp was said to be at the lowest elevation of any CCC camp in the region. At 2,700-foot elevation, 90 °F temperature, and a cactus desert environment, men of the Tanque Verde Camp found themselves in quite different circumstances from their previous camp's 9,000-foot elevation, -7°F temperature, and lodgepole pine environment. Carl Masters was an enrollee at the Tanque Verde Camp. He enrolled at Fort Francis E. Warren in Cheyenne, WY, and was first assigned to the Chimney Park Camp that moved to Tanque Verde. The Lowell Ranger Station was built by the CCC in 1934. It was constructed by enrollees from Tanque Verde Camp, F-42-A. As noted, Camp F-42-A was also involved in development of the Sabino Canyon Recreation Area. The ranger station is located below the Sabino Canyon Recreation Area and includes a residence, office, garage, barn, and workshop (fig. 125). The residence at Lowell Ranger Station faces east and is 33 feet 8 inches wide (fig. 126). The west, or back, end is 29 feet 7 inches wide, and the sides measure 43 feet 8 inches. There are front and back porches, now screened, although the front porch was originally open and had a wooden railing. Another enclosed porch or greenhouse was removed from the south side, leaving a 30-inch-high concrete wall. The residence's interior contains two bedrooms, bathroom, living room, dining room, and kitchen. Both bedrooms have double French doors leading to the south porch. The ceiling is made of thin wooden slats approximately 2 inches wide and peeled log beams that extend the length of the building. The exterior of the residence building is a 1-inch layer of stucco covering adobe bricks. The adobe walls are about 13 inches thick. The stucco is painted sage green. The residence roof is flat with small vents or drains added to allow water to drain off. There are metal gutter spouts on each side of the building. Windows are deeply set and are six-over-one, double-hung sash type in sets of two, with sets of three on the front. The building is in excellent condition and has had little or no alteration. The Lowell Ranger Station office is 30 by 31 feet (fig. 127). The building faces north. There is an open front porch with four square posts and concrete floor. Two front doors open into separate rooms. A 7- by 11-foot bathroom projects from the rear of the building. Inside the office there are wooden floors and a woodburning stove. The office walls are adobe covered with stucco. Windows are six-over-one, double-hung sash type and are deeply set. The garage is a large, south-facing building, 32 feet across. The east and west sides are 16 feet wide. On the east side is an attached barn measuring 12 by 12 feet. The garage building is divided into three sections, the 10 by 16 garage, the 10 by 16 machine shed, and the 16 by 16 storeroom. There are two large garage doors and a front door on the south side of the storeroom. Sets of two windows are on the north and south sides. These were originally six-over-one, double-hung sash windows, but have been replaced by multipaned casement windows. A door and overhang have been added to the east side of the building. The barn has a 4- by 5-foot grain bin, a hay window, manger, feed box, and a shed roof supported by brackets. Except for the unmaintained grounds, this complex is in excellent condition and remains closer to its original plan than any other ranger station examined. 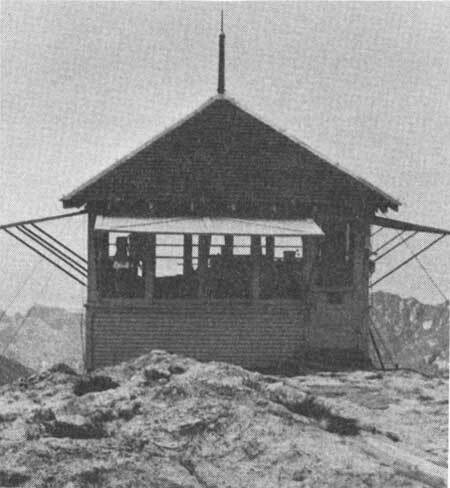 The Fly Peak Lookout is an example of a steel tower lookout with an accompanying log cabin. The tower is simple and functional. It is made of steel with a wooden cab. It is uncertain if the log cabin and lookout at Fly Peak were built by the CCC, but if so, they were probably constructed by Camp F-47. The cabin was of notched log construction and made to blend with the wooded surroundings. The structure no longer stands but was probably one room. 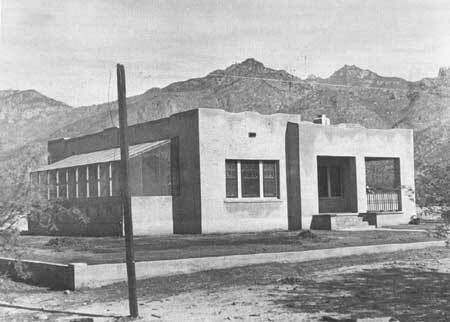 Camp Pena Blanca, F-64-A, was originally occupied on December 7, 1935. 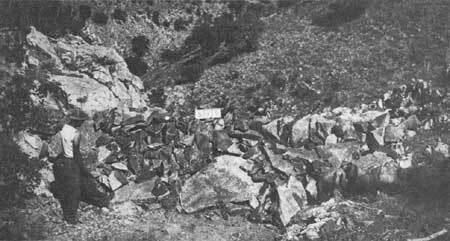 The camp was located in Walker Canyon, approximately 14 miles outside Nogales, AZ, in Santa Cruz County. The camp was 9 miles down a dirt road off the main highway, in an area . . .
Ernest White was F-64's project supervisor in 1936. A total of 124 enrollees and 12 LEM's were engaged on projects covering 100 square miles. Projects included construction, maintenance, and improvement of roads, fire trails, and recreational areas and water development. The camp was responsible for building the Nogales Ranger Station in 1937-38 and also built the storage house at the Patagonia Ranger Station. 1. Anne E. Harrison, The Santa Catalinas: A description and history (Tucson, AZ: Coronado National Forest; 1972 pp. 11-13. 2. Coronado Bulletin. April 13, 1934. Located at: Forest Supervisor's Office, Coronado National Forest, Tucson, AZ. 3. Harrison, The Santa Catalinas, p. 92. 4. Harrison D. Burrall, Forest recreation plan for Coronado National Forest. 1930. Extensively revised by Samuel P. Snow in 1939. Located at: Forest Supervisor's Office, Coronado National Forest, Tucson, AZ. 6. Adobe information taken from preservation brief no. 5, "Preservation of historic adobe buildings" and "Adobe worker specifications, for CCC enrollees." Located at: National Archives and Record Service, Washington, DC; Record Group 35. 7. Coronado bulletin. April 14, 1933. Located at: Supervisor's Office, Coronado National Forest, Tucson, AZ. 8. "Forest campsites are named for Arizona by G.A. Pearson," Arizona Daily Star. April 27, 1933. Located at: Arizona Historical Society, Tucson, AZ; CCC Records 1934-37, MS-125, box 1, folder 1. 9. CCC camp directories, 1933-42. Located at: National Archives and Record Service, Washington, DC; Record Group 35-13, 888, 889. 10. Coronado Bulletin. July 21, 1933 and August 8, 1933. Located at: Forest Supervisor's Office, Coronado National Forest, Tucson, AZ. 11. Coronado Bulletin. September 28, 1934. Located at: Forest Supervisor's Office, Coronado National Forest, Tucson, AZ. 12. James C. Reddoch. CCC camp inspection report, Camp F-10-A. February 23, 1935: p. 1. Located at: National Archives and Record Service, Washington, DC; Record Group 35-115, 973. 14. Coronado Bulletin. November 30, 1934. Located at: Forest Supervisor's Office, Coronado National Forest, Tucson, AZ. 16. A.W. Stockman. CCC camp inspection report, Camp F-10-A. March 23, 1939: pp. 3-4. Located at: National Archives and Record Service, Washington, DC; Record Group 35-115, 973. 20. Coronado Bulletin. November 6, 1939. Located at: Forest Supervisor's Office, Coronado National Forest, Tucson, AZ. 21. M.J. Bowen. CCC camp inspection report, Camp F-10-A. May 20, 1940: pp. 1-3. Located at: National Archives and Record Service, Washington, DC; Record Group 35-115, 973. 23. M.J. Bowen. CCC camp inspection report, Camp F-10-A. October 7, 1940: pp. 1-5. Located at: National Archives and Record Service, Washington, DC; Record Group 35-115, 973. 24. Ibid., p. 2, 5. 25. M.J. Bowen. CCC camp inspection report, Camp F-10-A. June 6, 1941: pp. 1-3. Located at: National Archives and Record Service, Washington, DC; Record Group 35-115, 973. 26. Coronado Bulletin. April 15, 1941; November 3, 1941. Located at: Forest Supervisor's Office, Coronado National Forest, Tucson, AZ. 27. M.J. Bowen. CCC camp inspection report, Camp F-10-A. February 4, 1941: pp. 1-3. Located at: National Archives and Record Service, Washington, DC; Record Group 35-115, 973. 29. CCC camp directory, 1941-42. Located at: National Archives and Record Service, Washington, DC; Record 35-115, 889. 30. Coronado Bulletin. May 5, 1933, May 12, 1933, and May 26, 1933. Located at: Forest Supervisor's Office, Coronado National Forest, Tucson, AZ. 31. "CCC boys enjoy life in Arizona," Tucson Daily Citizen. June 1933. Located at: Arizona Historical Society, Tucson, AZ; CCC Records, MS-125, box 1, folder 1. 34. Coronado Bulletin. August 25, 1933. Located at: Forest Supervisor's Office, Coronado National Forest, Tucson, AZ. 35. Coronado Bulletin. October 27, 1933. Located at: Forest Supervisor's Office, Coronado National Forest, Tucson, AZ. 36. Coronado Bulletin. January 12, 1934. Located at: Forest Supervisor's Office, Coronado National Forest, Tucson, AZ. 37. Coronado Bulletin. August 10, 1934, September 28, 1934, December 14, 1934. Located at: Forest Supervisor's Office, Coronado National Forest, Tucson, AZ. 38. Coronado Bulletin. November 30, 1934, and February 15, 1935. Located at: Forest Supervisor's Office, Coronado National Forest, Tucson, AZ. 39. Coronado Bulletin. May 10, 1935. Located at: Forest Supervisor's Office, Coronado National Forest, Tucson, AZ. 40. CCC camp directory, 1941-42. Located at: National Archives and Record Service, Washington, DC; Record Group 35-115, 889. 41. Robert Lenon. Letter to William Piper, range technician, Patagonia Ranger Station, Coronado National Forest, Patagonia, AZ. November 9, 1982. Supplied to the authors by William Piper, Coronado National Forest, Tucson, AZ. 42. Henry Dojaquez. Interviewed by Alison Otis and Kimberly Lakin for Pacific Crest Research and Services Corporation, Corvallis, OR, at Patagonia, AZ. Located at: History Section, USDA Forest Service, Washington, DC. 43. Louis Valenzuela. Interviewed by Alison Otis and Kimberly Lakin for Pacific Crest Research and Services Corporation, Corvallis, OR, at Patagonia, AZ. Located at: History Section, USDA Forest Service, Washington, DC. 44. Coronado Bulletin. August 25, 1933. 45. A.W. Stockman. CCC camp inspection report, Camp F-12-A. October 26, 1937: p. 1. Located at: National Archives and Record Service, Washington, DC; Record Group 35-115, 973. Also: Coronado Bulletin. May 4, 1934. Located at: Forest Supervisor's Office, Coronado National Forest, Tucson, AZ. 46. J.C. Reddoch. CCC camp inspection report, Camp F-12-A. February 23, 1934: p. 1. Located at: National Archives and Record Service, Washington, DC: Record Group 35-115, 973. 47. Coronado Bulletin. November 30, 1934, and May 10, 1935. 48. A.W. Stockman. CCC camp inspection report, Camp F-12-A. October 25, 1937: p. 4. Located at: National Archives and Record Service, Washington, DC; Record Group 35-115, 973. 49. Coronado Bulletin. June 28, 1935. Located at: Forest Supervisor's Office, Coronado National Forest, Tucson, AZ. 50. See reference note 48, p. 5. 53. Coronado Bulletin. October 17, 1938. Located at: Forest Supervisor's Office, Coronado National Forest, Tucson, AZ. 54. CCC camp directory, 1941-42. Located at: National Archives and Record Service, Washington, DC; Record Group 35-115, 889. 55. Coronado Bulletin. June 9, 1933. Located at: Forest Supervisor's Office, Coronado National Forest, Tucson, AZ. 56. Coronado Bulletin. August 25, 1933. 57. Coronado Bulletin. February 16, 1934, April 13, 1934. 58. Coronado Bulletin. September 15, 1933. Located at: Forest Supervisor's Office, Coronado National Forest, Tucson, AZ. 59. Coronado Bulletin. November 30, 1934. 60. Alex Gonzales. Interviewed by Alison Otis at Canelo Ranger Station, Canelo, AZ, for Pacific Crest Research and Services Corporation, Corvallis, OR. Located at: History Section USDA Forest Service, Washington, DC. 61. Coronado Bulletin. November 18, 1932, December 2, 1932, December 9, 1932. Located at: Forest Supervisor's Office, Coronado National Forest, Tucson, AZ. 62. Coronado Bulletin. February 3, 1933, June 16, 1933. Located at: Forest Supervisor's Office, Coronado National Forest, Tucson, AZ. 63. James C. Reddoch. CCC camp inspection report, Camp F-30-A. February 26, 1935: p. 1. Located at: National Archives and Record Service, Washington, DC: Record Group 35-115, 973. 65. Coronado Bulletin. May 4, 1934. 66. A.W. Stockman. CCC camp inspection report, Camp F-30-A. October 14, 1936: p. 3. Located at: National Archives and Record Service, Washington, DC; Record Group 35-115, 973. 67. Coronado Bulletin. May 18, 1934. Located at: Forest Supervisor's Office, Coronado National Forest, Tucson, AZ. 68. Coronado Bulletin. November 30, 1934, October 4, 1935. Located at: Forest Supervisor's Office, Coronado National Forest, Tucson, AZ. 69. James C. Reddoch. CCC camp inspection report, Camp F-30-A. November 4, 1935: p. 1. Located at: National Archives and Record Service, Washington, DC; Record Group 35-115, 973. 71. See reference note 66, pp. 1-5. 74. A.W. Stockman, CCC camp inspection report, Camp F-30-A. December 31, 1937: p. 3. Located at: National Archives and Record Service, Washington, DC; Record Group 35-115, 973. 76. A.W. Stockman. CCC camp inspection report, Camp F-30-A. February 2, 1938: pp. 1-2. Located at: National Archives and Record Service, Washington, DC; Record Group 35-115, 973. 77. Coronado Bulletin. September 18, 1941. Located at: Forest Supervisor's Office, Coronado National Forest, Tucson, AZ. 78. Harrison D. Burrall, Forest recreation plan, Coronado National Forest. 80. Coronado Bulletin. November 17, 1934, and May 18, 1934. Located at: Forest Supervisor's Office, Coronado National Forest, Tucson, AZ. 81. Coronado Bulletin. September 28, 1934, November 9, 1934, and December 28, 1935. Located at: Forest Supervisor's Office, Coronado National Forest, Tucson, AZ. 82. Carl Masters. Letter to John C. Irish, NACCCA, Chapter 44, Phoenix, AZ. March 22, 1982. Supplied to the author by John Irish, NACCCA, Chapter 44, Scottsdale, AZ. 83. See reference note 82. Also: Coronado Bulletin. May 17, 1935. Located at: Forest Supervisor's Office, Coronado National Forest, Tucson, AZ. 84. Official annual, Civilian Conservation Corps, Phoenix district. 1936: p. 29. Supplied to the author by John Irish, NACCCA, Chapter 44, Scottsdale, AZ. 85. James C. Reddoch. CCC camp inspection report, Camp F-47-A. October 31, 1935: p. 1. Located at: National Archives and Record Service, Washington, DC; Record Group 35-115, 974. 86. Coronado Bulletin. August 30, 1935. Located at: Forest Supervisor's Office, Coronado National Forest, Tucson, AZ. 87. See reference note 84. 90. Coronado Bulletin. October 4, 1935. Located at: Forest Supervisor's Office, Coronado National Forest, Tucson, AZ. 91. A.W. Stockman. CCC camp inspection report, Camp F-47-A. October 29, 1936: p. 1. Located at: National Archives and Record Service, Washington, DC; Record Group 35-115, 974. 92. Turkey Creek Gobbler. December 1935-January 1936. Located at: Arizona Historical Society, Tucson, AZ. 93. The mountain ranger, Turkey Creek, AZ. March 1937. Located at: Arizona Historical Society, Tucson, AZ. 94. Coronado Bulletin. May 15, 1937. Located at: Forest Supervisor's Office, Coronado National Forest, Tucson, AZ. Also: See reference note 100. Although dates differ, the camp moved either on May 15, 1936, or May 15, 1937. 95. Coronado Bulletin. October 27, 1933, and June 15, 1936. Located at: Forest Supervisor's Office, Coronado National Forest, Tucson, AZ. Also: CCC camp directory. 1941-42. Located at: National Archives and Record Service, Washington, DC; Record Group 35-115, 889. 96. A.W. Stockman. CCC camp inspection report, F-64-A. October 19, 1936. p. 1. Located at: National Archives and Record Service, Washington, DC; Record Group 35-115, 974. The opening date conflicts with the Coronado Bulletin of October 25, 1935, which says the camp opened then, a more realistic date. 104. The Live Oak, CCC newspaper. Located at: Arizona Historical Society, Tucson, AZ. 105. Coronado Bulletin. March 15, 1937, December 1, 1937, October 17, 1938. Located at: Forest Supervisor's Office, Coronado National Forest, Tucson, AZ. 106. B.E. Meadows. Report of investigation. February 8, 1939: p. 1. Located at: National Archives and Record Service, Washington, DC; Record Group 35-115, 974. 108. A.W. Stockman. CCC camp inspection report, Camp F-64-A. February 24, 1939. Supplemental report, p. 3. Located at: National Archives and Record Service, Washington, DC; Record Group 35-115, 974. 112. D.G. Revello. CCC camp educational report, Camp F-64-A. February 24, 1939: p. 1. Located at: National Archives and Record Service, Washington, DC; Record Group 35-115, 974. 113. Coronado Bulletin. May 16, 1939. October 4, 1939. May 1, 1940. Located at: Forest Supervisor's Office, Coronado National Forest. 114. M.J. Bowen. CCC camp inspection report, Camp F-64-A. June 4, 1941: pp. 1-2. Located at: National Archives and Record Service, Washington, DC; Record Group 35-115, 974. 115. Dennis Kieffer. Report to Don Wood, archaeologist, Coronado National Forest, Tucson, AZ. Located at: Forest Supervisor's Office, Coronado National Forest, Tucson, AZ. Kieffer interviewed several informants while preparing his report. The informants included Gilbert Sykes, former forest ranger; Tommy Bell and William "Sonny" Clark, ranchers in the Walker Canyon area; Fred Noon; and Horton Noon.